Trend of the moment: Escarole — you heard it here first. You will find it braised, grilled, steamed, stir-fried, in salads, shredded, roasted, stuffed…everywhere. I just love, love, love Bon Appetit‘s “faux shrimp” cocktail made with — no, not surimi — but with a head of fresh cauliflower, in the new February issue. Not sure why it tickles me so, but I can’t wait to try it. The recipe comes from Chef Kevin Roberts from “The Black Sheep” in Richmond, Virginia. According to the chef, it is a dead ringer for the real thing: Cauliflower florets are briefly poached in water seasoned with crab boil spices, onions, garlic and lemons, and then served with cocktail sauce. The recipe alone is worth the price of the mag. going, New York food maven Arthur Schwartz mentioned that the hamburgers were awfully good. Would never have imagined but my burger was fabulous! A perfectly-cooked rare cheeseburger with smothered onions. Juicy beyond all get out, great flavor, affordable. Good beets, pickles, slaw and a very nice waiter. And while the cheesecake at Junior’s is excellent — and certainly famous — we were lunching with another famous baker… Anne Kabo from Margate, New Jersey. It is her recipe for cheesecake that is featured in Radically Simple. Check it out; it’s sublime. The finest “bruschetta” in the world is found at abckitchen. It is chef Dan Kluger’s kabocha squash and goat cheese seasonal offering — and that is almost over, too. Hurry, hurry. Dying to go back to Tony Zazula’s Commerce restaurant (we had our Thanksgiving there) and to Drew Nieporent’s Corton. Also eager to try Danny Meyer’s newest venture — North End Grill with super-star chef Floyd Cardoz at the ovens. I want their Grilled Clam Pizza now! Welcome to a new feature on my blog. Every weekend I’ll be re-capping the special things I ate, drank, or cooked the previous week. Here’s the first installment — posted Sunday, June 20th. Please feel free to share your experiences. I am always interested! 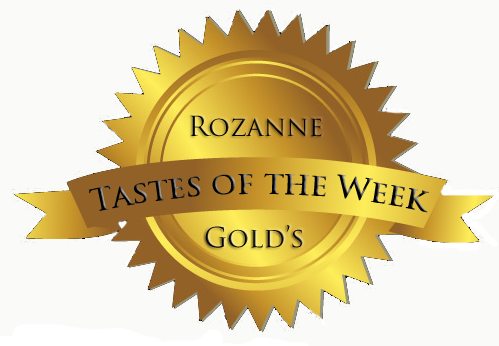 Let me know about any wonderful wine-and-food pairing discoveries, great things you ate, wonderful new recipes you cooked, or any new ingredients you’ve tried. And I’m always on the lookout for wonderful three-ingredient recipe ideas and radically simple ones, too. A fabulous dessert at Barbounia called kanafeh –– made of warm shredded phyllo, ricotta cheese, rose-water syrup, pistachios & honey with anise ice cream. A glass of tocai friulano at Sfoglia (great with their crispy roast chicken under a brick). A big plate of sauteed broccoli rabe (with a good pizza) at Zero Otto Nove (new location on West 21 st.). Roast pig with bacon marmalade (fabulous!) made with beets & apples at ABC Kitchen. Smoked corn on the cob with herb butter at the newly-opened Soco on Myrtle Ave. in Brooklyn. A ragout of oysters and mushrooms (in a creamy green crab reduction) from Hundred Acres at a party sponsored by Edible Manhattan. The spicy tofu ssam from BaoHaus at the premiere of Ferran Adrià’s new movie/documentary. 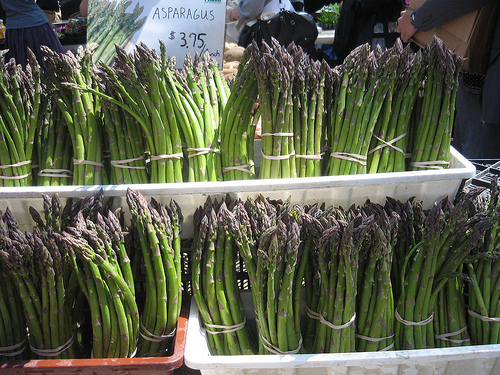 While walking through the splendorous Union Square Market yesterday, looking for new arrivals, I noticed small fragrant strawberries and the loveliest asparagus I’ve seen in a long time. Those strawberries would wind up in a wonderful dessert I had last night at abc kitchen (located just a few blocks from Union Square) — a kind of strawberry compote decorated with tiny meringues and topped with a quenelle of sour cream-poppy seed ice cream. But those asparagus, crisp and green and just the size I love — not too thin and not too thick — reminded me of “the recipe that made me famous.” Way back in 1995 when no one was roasting asparagus, except for my friend Arthur Schwartz, nobody, and I mean nobody, was frying capers, except me! 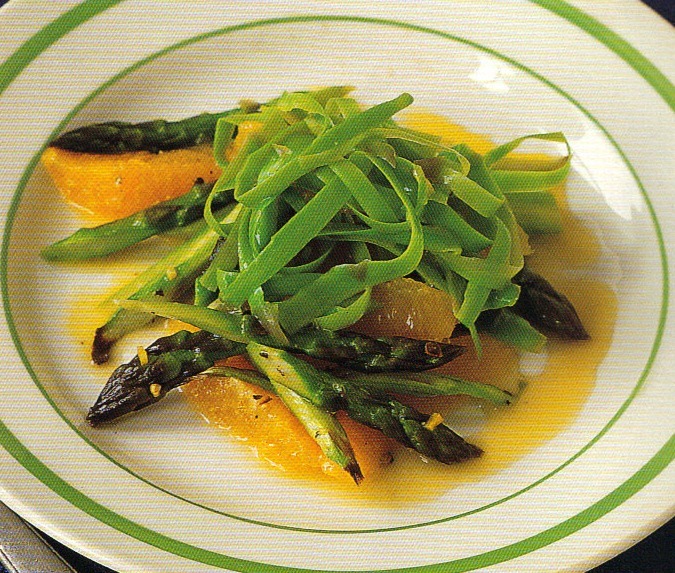 The resulting recipe for “Oven-Roasted Asparagus, Fried Capers” was to appear in Recipes 1-2-3: Fabulous Food Using Only Three Ingredients, published in 1996 by Viking. The headnote went like this: In less than ten minutes you can have the most addictive asparagus you’ve ever encountered. An intense dose of heat keeps these spears green and snappy. Deep-fried capers add a startling accent. A wonderful Mediterranean-inspired first course or side dish.” (recipe below). This recipe would come to be a favorite of Ruth Reichl, the restaurant critic of the New York Times. Fifteen years later, in Radically Simple, I added a fourth ingredient — fresh bay leaves — which impart a mysterious perfume. Just this morning I decided to punch in “roasted asparagus and fried capers” into the humming Google search bar. There are millions (I exaggerate) of citings for this recipe — with no mention of me or where the recipe came from. But now you know. Some years later, in my book Healthy 1-2-3, I also did something no one had done with asparagus. For a lovely, and very healthy asparagus and orange salad, I boiled the peelings from the asparagus until they were al dente and topped the salad with my original “asparagus fettuccine” — for it is exactly what it looked like! Just recently I noticed this idea in a new cookbook. But now that I’ve begun a practice of daily “meditation” and reflection, this stuff doesn’t bother me at all. Enjoy! There are many reasons to enjoy the James Beard Awards. The big one, held last night at Lincoln Center’s Avery Fisher Hall, is a tribute to the hospitality industry, to its star chefs and sommeliers, to the country’s best new restaurants and most beloved older ones; to lifetime achievement awards, and to those who are feeding our planet in deeply nourishing ways — from Farmer Lee, to the guiding lights behind FareStart, a Seattle-based nonprofit that provides culinary job training and placement for homeless and disadvantaged individuals, who deservedly won this year’s Humanitarian Award. It is also a nod to the ingenuity of the many chefs who fed the thousands of us last night, cocktail-party style, with an impressive assemblage of sophisticated and delicious small bites reflecting the “melting pot” that now defines us. I drank the best tequila I ever had, tried a kickass rose wine from Bedell Cellars, and sipped a supple grenacha from Spain between breaks. It’s a long night, after all, “the Oscars” of the food world. There was a sense of jubilation all evening, but for me, one of the most anticipated categories was best new restaurant. And the winner?…ABC Kitchen! I was thrilled as it was my favorite new restaurant this year. I have been dozens of times, experiencing something delicious and also intangible each time. As a farm-to table restaurant with the majority of its ingredients coming from nearby farms, it is the mission that drives the food — green in every way imaginable — done in contradictory elegance and sophistication. While Jean-Georges, whose restaurant it is, has always been my hero, ABC’s chef, Dan Kluger, is an up-and-coming star. He is the very best of the new generation of chefs — tattoo-less in fact — centered, smart, and affable, who possesses an amazing palate. Dan runs counter to the ‘bad-boy’ persona of so many young chefs today because he possesses real confidence and skill. He’s a breath of fresh air. But the real creative spirits behind the restaurant are, in fact, Paulette Cole and Amy Chender, who intuited the food world’s next step and conjured up a magical dining room to showcase the artistry of the planet — from its natural resources to its edible gifts. Paulette is the stunning visionary behind abc home and Amy is its beautiful COO. They are mindful of the earth and continue to foster the majesty of Dan’s food. Their mission statement, running the entire length of the back of the menu, should be required reading. I am so pleased for them. And for Dan. But hey, reservations may be hard to come by.